HARI SREENIVASAN: In the heart of Appalachia, generations of coal miners have lived through good times and bad. BERTHA FARLEY, Grandmother of Chris Farley: Middle. CHRIS FARLEY: Middle tomatoes. Then we will have late tomatoes. BERTHA FARLEY: Late tomatoes to can. 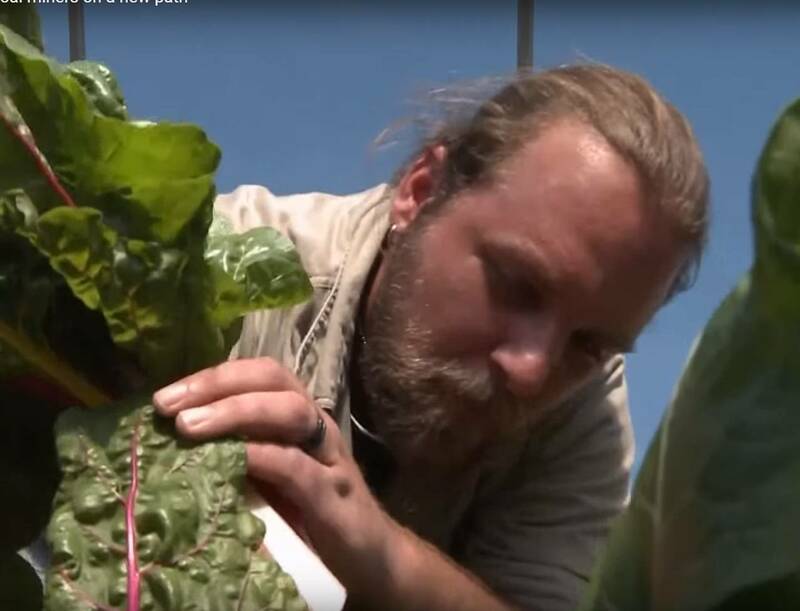 HARI SREENIVASAN: When coal miner Chris Farley was laid off two years ago, he began growing food on his grandmother’s West Virginia lot to feed his family. BERTHA FARLEY: I’m telling him, you have got to grow what you eat. You have got to survive. In this area, most of all, you have to eat. CHRIS FARLEY: I got laid off, and there was no jobs around here to be found. They went from jobs everywhere to nothing. And I was actually at the point of going from door to door with my neighbors, seeing if they need grass mowed or weeds cut, or just any odd jobs to try to pay the power bills and anything, whatever it took to provide for my family. HARI SREENIVASAN: Between 1980 and 2015, the number of coal jobs fell by 60 percent, due to automation and competition from natural gas. But even before the decline, Bertha Farley had lived through many coal industry downturns. BERTHA FARLEY: My daddy got laid off, and I had five brothers, and they all had to leave here. No work. HARI SREENIVASAN: Still, her son Floyd and grandson Chris both became miners. CHRIS FARLEY: My dad, when he got old enough, he went into the coal mines, so I followed his footsteps, and went into the coal mines. HARI SREENIVASAN: It wasn’t a choice Floyd Farley wanted for his son. FLOYD FARLEY, Former Coal Miner: I wanted him to go to West Virginia University. I tried to explain to him, I said, you don’t have to be like you’re old man. You won’t have to be out here, breathing this dust. You can sit in an office somewhere. I said, it sure beats the heck out of coal mining. HARI SREENIVASAN: But, in 2002, when Chris Farley graduated from high school, working at the coal mine meant top wages. CHRIS FARLEY: I made over $50,000 a year as soon as I started out, straight out of high school, with no college, nothing. HARI SREENIVASAN: Some believe the high wages created an unhealthy dependence on coal jobs. BRANDON DENNISON, CEO, Coalfield Development Corporation: You don’t want to put all your eggs in one basket, which is the mistake that West Virginia made with the coal industry. HARI SREENIVASAN: Brandon Dennison grew up in Appalachia, but left to study social entrepreneurship. After earning his master’s, he returned to retrain displaced workers. BRANDON DENNISON: The moral arguments, I’m not interested in on coal, but it’s like investing your money. You never put it all in one investment account. You spread it out, you diversify. HARI SREENIVASAN: In 2010, Dennison formed a nonprofit called the Coalfield Development Corporation. With financial support from the Appalachian regional commission, the nonprofit launched new businesses that Dennison believes will generate sustainable jobs, everything from furniture making and solar installation, to home building and agriculture. BRANDON DENNISON: What we need is a diversified economy, with lots of different businesses and lots of different opportunities for all different types of people. HARI SREENIVASAN: Coalfield crew members are paid $11 an hour and given 33 work hours per week, an amount that doesn’t come close to their former coal job wages. They must also attend three hours of life skill classes, and six hours of community college. Money to pay crew members comes from sales, contracts, and private and public funders. BRANDON DENNISON: We are not just creating a job for these folks, many of whom still need a lot of job training, but we’re also enrolling them in the local community college. And then we’re providing three hours a week of personal development to figure out how business works and to be successful. HARI SREENIVASAN: Chris Farley is now an honors student working toward his associates degree in applied science and agriculture. CHRIS FARLEY: I can still pay my bills. I’m getting an education that I would never thought I would get. I never thought I would be in school. I never thought — never dreamed I would have a 4.0 GPA. BRANDON DENNISON: The bottom line is, if you look at states with low numbers of higher education attainment, like we have, there are not a lot of jobs. And if you look at states and communities with high numbers of people with degrees of higher education, you see a lot more jobs. HARI SREENIVASAN: One project, called Refresh Appalachia, brings former coal miners like Chris Farley back to a mining site. BRANDON DENNISON: We have all of these mine land sites that we have got to do something with, right? These are massive former mountaintop removal sites that are sitting there kind of not being used productively. HARI SREENIVASAN: On this mountaintop in Mingo County. Dennison’s workers are transforming a former mine into a farm that serves local markets. CHRIS FARLEY: We’re planting all this, different types of berries, and pawpaw trees, and we’re going to have a big orchard, different types of stuff to sell, goji berries, blackberries, raspberries, elderberries. HARI SREENIVASAN: James Russell is the farm’s crew chief. JAMES RUSSELL, Crew Chief, Coalfield Development Corps: We have lots of interest with restaurants for our meat and eggs, and our berries also. We have goats, pigs, and chickens, and they give back to the land. And the pigs tear it up. It’s just a good combination of fertilizer when you mix the three together. After a couple of years of working the soil, you can grow anything you want. HARI SREENIVASAN: Crew member Jared Blalock worked for six years in the mine industry. JARED BLALOCK, Former Coal Miner: Running a dozer on the coal pile, taking care of the stacker belt, shoveling, greasing, just your everyday labor. HARI SREENIVASAN: Now he’s refurbishing old buildings for a Coalfield Development project called Restore Appalachia. As part of his employment, Blalock is working toward his associate’s degree in management. He says he’d go back to the mines if a job was available, but worries about the instability of the industry. JARED BLALOCK: I don’t have anything wrong with coal mining. Coal mining is a — it’s a great industry here, but you don’t know. That’s the thing about it. That’s why I’m doing this right now, because I need to take advantage of my opportunity. HARI SREENIVASAN: So far, 23 crew members have completed their degrees and have been placed in full-time jobs; 55 are currently in the program, and 15 are on the waitlist. Chris Farley hopes to use his degree and work experience to start a business of his own. CHRIS FARLEY: I would like to actually start my own restaurants called Homegrown Home Cooking. My little girl, she’s going to help me with the farm. My wife is going to help me. We’re just going to start our own little business. HARI SREENIVASAN: For the PBS NewsHour, I’m Hari Sreenivasan. JOHN YANG: There’s more online from our series Rethinking College, including a look at a Tennessee pilot program that helps ease the financial burden so adults can finish their college degrees. You will find that at PBS.org/NewsHour.